One of our readers, Sam, mentioned that an essay by the Uruguayen poet and writer Eduardo Galeano was required reading in his sustainable transportation class. The essay is titled The Sacred Car and is in the book Upside Down - A Primer for the Looking-Glass World. "Human rights pale beside the rights of machines. In more and more cities, especially in the giant metropolises of the South, people have been banned. Automobiles usurp human space, poison the air, and frequently murder the interlopers who invade their conquered territory - and no one lifts a finger to stop them. Is there a difference between violence that kills by car and that which kills by knife or bullet?" The rest of the essay is just as to the point. I've never had anything in common with a respected Uruguayen - writer or otherwise - before but I'm pleased how his title The Sacred Car is reflected in the essay about The Sacred Bull in Society's China Shop. "I saw a cigarette ad in a magazine with the required public health warning: 'Tobacco smoke contains carbon monoxide.' But the same magazine has several car ads and not one of them warned that car exhaust, nearly always invisible, contains much more carbon monoxide. People can't smoke. Cars can." All in all the essay is refreshing in its tone and no-nonsense approach to contemplating the destructive road we're all travelling down. 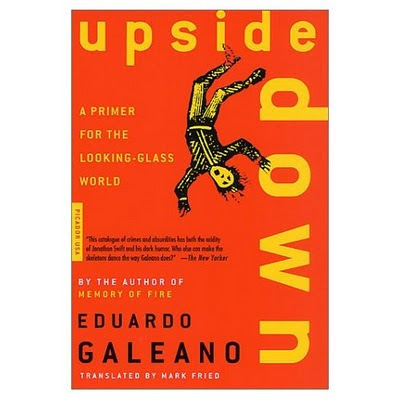 Salon has a piece about the book which is worth reading: "Upside Down" by Eduardo Galeano. The author of "Memory of Fire" delivers a scathing, mischievous indictment of North America's hypocrisy and consumer culture.